An olive oil decanter not only looks elegant, it serves a functional purpose too. Olive oil decanters serve all three purposes. Some types of olive oil contain sediment. Sediment is especially prevalent in inexpensive olive oils or types other than extra virgin olive oil. Extra virgin olive oil is the first pressing from the olives. Many chefs consider extra virgin olive oil the finest. It is reputed to have the best taste along with the least amount of sediment. As you pour the olive oil from its original container into the decanter, the sediment is left behind, thus providing the purest oil possible. Like white truffle oil, a high quality olive oil may be enjoyed sparingly as a seasoning rather than as a major ingredient. Decanters may also provide better storage than the original bottle, especially if the original container is made from clear glass. To retain optimal flavor, olive oil should be stored in a cool, dark place. While more expensive oils come in dark colored bottles or containers, most more affordable versions do not. Light and heat are the enemies of olive oil. Decanters made from ceramic or dark glass provide the perfect darkened environment to retain the delicate flavors of olive oil. Decanters also add an air of elegance and refinement to the gourmet table. Rather than just putting out a bottle of oil replete with manufacturer's label - and possibly a price sticker - decanting into an elegant container demonstrates a level of dining sophistication. Many decanters for olive oil also have a stainless steel or glass pouring spout. When serving olive oil at the table, a stainless steel or glass pouring spout prevents unsightly drips. Nothing ruins a fine dining experience like rings of olive oil left on a spotless tablecloth when the oil drips and settles around the base of the container. Slanted pouring spouts guide the oil smoothly back into the container once guests drizzle their salads or meals. Because you want to preserve the fine taste of your olive oil, look for a glass or glazed ceramic decanter. Both glass and glazed ceramic guard the flavor of olive oil and prevent odors from spoiling it. These materials can also be safely stored in the refrigerator, which is often recommended for olive oil, especially if the kitchen gets hot. The dark, cool space inside a refrigerator may enhance the shelf life of the olive oil. Look for decanters with cylindrical glass, metal or rubber stoppers. Consumers sometimes report problems with stoppers popping up and not staying in place. If that happens, check to make sure no olive oil residue is left around the decanter where the stopper fits into it. The oil may cause the seal to fail and push the stopper out. Simply wipe with a clean cloth and replace the stopper. 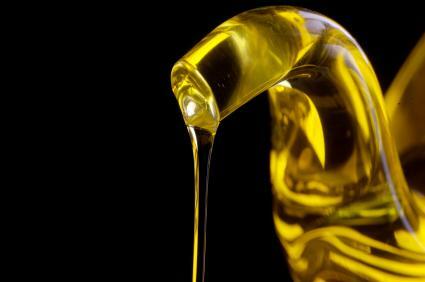 Olive oil can also go bad or rancid, causing gases to form within the decanter and push the stopper out of the bottle. Check to make sure the oil isn't rancid. Discard it if it tastes or smells off. Olive Oil Decanters features hand-thrown and hand-glazed fine ceramic stoneware decanters from Rupert Blamire Ceramics, U.K. Available in a wide variety of colors, these modern-style decanter can double as works of art. Bella Cucina offers a decanter decorated with an olive motif. It holds 750 milliliters of olive oil, and looks great with informal tableware. The Post Gourmet features a decanter and dipping set for olive oil enthusiasts. Serve this at your next Italian gourmet meal along with great breadsticks and let guests pour their own olive oil from the decanter into the dipping set bowls. Instead of buttering bread, guests swirl their breadsticks or slices into the fresh oil in the matching bowls. No matter which decanter you choose, you'll never go back to using olive oil directly from the jar once you try an elegant decanter for the table.